"A simple carbonated punch with champagne, ginger ale and frozen strawberries." I pureed the strawberries instead of leaving them whole and dipped the edge of the glasses in decorative sugar. Good easy punch and my guests really liked it. Prepared this for a wedding shower I was hosting. It was a huge hit and simple to make. 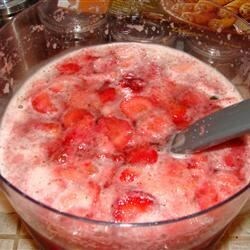 This was a good punch for a crowd: inexpensive, tasteful, & easily modified...I added frozen raspberries & an extra bottle of champagne as well.